The Secretary of the Interior arrived in Grand Staircase-Escalante National Monument midday on May 10, 2017. 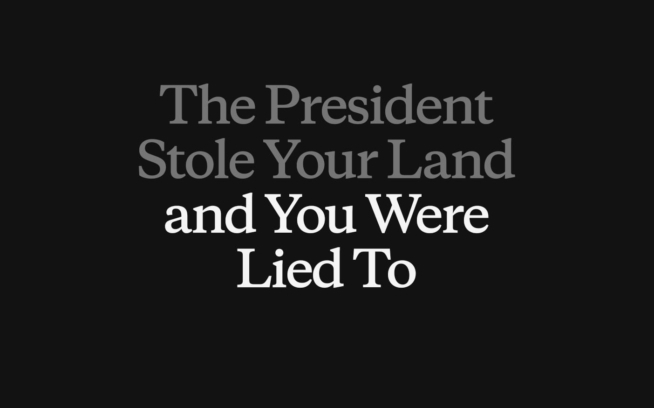 He came to perform an “assessment” of the monument—to see whether the current boundaries overstepped their task of protecting natural and cultural resources and spurring economic growth. It was raining, windy and cold, but hundreds of locals gathered at the airport to welcome him and voice why they support the monument. He flew in, boarded a private helicopter, then left the region as quickly as he came. No public meetings. No stakeholder engagement. Grand Staircase-Escalante National Monument defines the idea of wilderness. The landscape is equally raw and intimidating as it is intimate and welcoming. Slick rock covers the landscape. Rising plateaus are littered with pine trees in the higher elevations and swept barren in the lower regions. The Escalante River and its tributaries have carved canyons of every size and form throughout the monument—from narrow slots to broad gulches. While rivaling the natural beauty of nearby Bryce and Zion National Parks, Grand Staircase-Escalante has been left comparatively undeveloped for human access and recreation. A few paved roads slice the monument, but most access is seen down dirt roads and washes that can be impassible after rain. Formal trails don’t really exist out here. Sparse cairns mark the way of past adventurers, or a river itself is often the easiest path to get to your final destination. 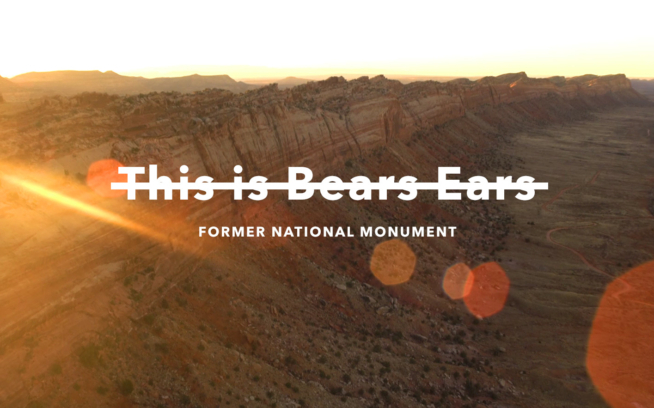 Tell the Department of the Interior why our national monuments should be left alone. The deadline to comment is July 9, 2017. A group of five of us went out to visit the Grand Staircase-Escalante in the middle of May. Our goal was to trail run throughout the monument for a few days. To explore, connect with and document the place. To share what amazing recreational opportunities are present in a place that is currently under threat, like many of our public lands. Even though the monument has been in place for over 20 years, the current administration is questioning its value and validity, and looking to open up the monument’s coal deposits once again. We wanted to see the place and do what we could, however small it may be, to help the locals protect this treasure which is the backbone of their history, economy and spirituality. We hatched our plan and connected with Nicole Croft, the Executive Director of Grand Staircase Escalante Partners, a scrappy non-profit working in the area to protect and conserve the monument. She helped us put together a plan for our trip—finding long routes that would trash our legs in pursuit of exploration. Our first day of running took us into the heart of the monument. We followed cairns over slick rock and picked our way down to the Escalante River where the trail mysteriously disappeared into the thick brush. We waded the river for a while, crossing land a few times, explored up a side canyon and reversed our tracks back to the car. The monument was established under the Clinton Administration in 1996, under the mandate to “protect the myriad historic and scientific resources” of the region. It has since become known as the “Science Monument” due to the vast amounts of fossils, archaeological sites and unique biological resources found within its boundaries. This directly aligns with the mission of the Antiquities Act, established by Theodore Roosevelt in 1906, which gives the president the power to protect “historic landmarks, historic and prehistoric structures, and other objects of historic or scientific interest.” All of these interests lie within Grand Staircase-Escalante, yet its establishment and current standing are not without contention. To this day, opponents of the monument cite its existence as hindering economic development. 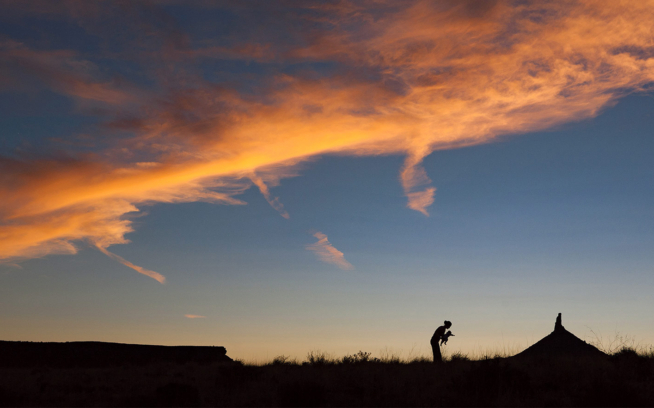 The monument did lock up a decent amount of coal deposits found high in the Kairparowitz Plateau, but border communities have seen economic growth that surpasses the average of the State of Utah. They built their economies on tourism—outfitters, guides, hotels, restaurants—sustainable forms of income that are not reliant on a limited resource that has been in a bust cycle throughout the rest of the nation. Elsewhere, ranchers still graze their livestock on 96% of the monument (these permits were grandfathered into the monument designation). Yet, it has become clear that the current administration is laser focused on re-opening the monument to coal mining once again. Grand Staircase-Escalante is an endless playground to explore. While we were excited to hit as many miles of trail as we could, we all felt the sense that we should dial back the miles in exchange for connecting more with the local community. We changed routes on day two and met up with a rag tag group of runners who were enthused to show solidarity for the monument—some local trail enthusiasts, some folks passing through town, a modern-day survivalist who lives off the land (and ran us into the ground) and even a bachelorette party showed up to run. 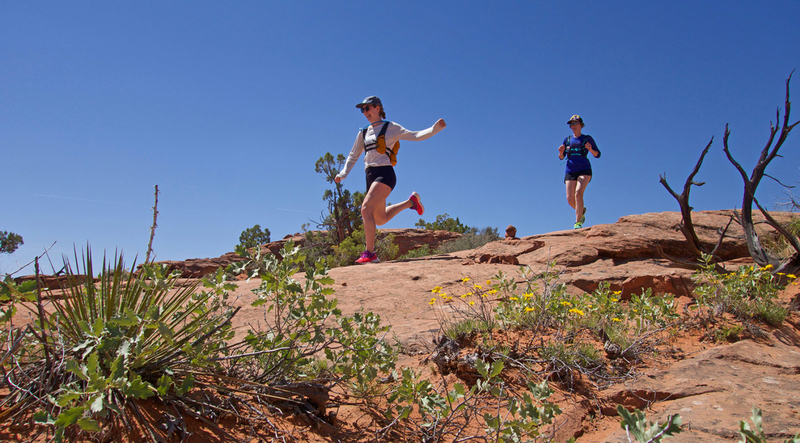 We split into two groups and ran in opposite directions along a 15-mile stretch of the Escalante River, fording the river 30 times along the way. Our shoes were soaked, our legs torn up from the faint trail system that often led straight into a thicket of sorts, yet we barely saw anyone else amidst the awe-inspiring sandstone cathedral walls. The crew went back to camp to rest up and grab a quick burrito, then headed into town to Escalante Outfitters. We joined up with Nicole and her staff and the Outfitters to host a “Save Grand Staircase” party that night. The public comment period on the monument had just opened, so we had locals sign postcards addressed to the Department of the Interior. We raised money for Grand Staircase Escalante Partners, got an update on the campaign, drank some beers and ate good food. It was a call to action, but it was also a celebration. Over 100 people came to the event (out of a town of 600, that is a good proportion) to celebrate the monument after a long, hard week. Grand Staircase-Escalante was the first national monument to be governed by the BLM, and it has proven to be successful. The natural environment is thriving, local economies are growing through sustainable means, more fossils and cultural history artifacts are being found. It is doing what it is intended to and more—a model of success. In a time when we are all pushing for more resilient and sustainable economies, it seems absurd to not only ignore alternative ways of driving our economy, but to do so in a way that deteriorates a national treasure that has been protected for over two decades. If we break down this model monument, what else do we have to stand on going forward? Our final day of running involved an overland trail from the town of Boulder back to Escalante. A 15-mile slick-rock route that was one of the most magnificent runs I’ve had in years. We only lost our way a few times amidst the vast landscape and escaped Death Hollow with a few scratches, a decent amount of poison ivy and one crazy rash from a furry caterpillar that found its way onto my forearm. One thing is clear about Grand Staircase-Escalante: it is a place for adventure. It runs counter to the direction of many of our national parks, which are designed for recreational access. There aren’t paved trails, marked features or even many guide books to orient yourself to the area. But, maybe that’s the point. There are some places that should be left wild for wild’s sake, not solely for human use and certainly not for human abuse. We came into the experience looking to highlight the recreational opportunities and motivate others like us to protect the monument. We left with a sense of awe for the sheer wildness of a place that was designed to protect just that. There are few places on this earth that are still left in a state of true wilderness. Yet, even these places are being threatened. We live in a unique time, when many of the bedrock ideals that a lot of us embrace are being challenged. We need more defenders, more than ever. But we also need to defend the idea of wilderness—what it stands for, what it provides, what it protects. Tell the Department of the Interior why Grand Staircase-Escalante National Monument, and all of our national monuments should be left alone. The deadline to comment is July 9, 2017. To get more involved, connect with the good folks at Grand Staircase Escalante Partners. Paul Hendricks was born and raised on the Third Coast, a.k.a. Lake Michigan, where he developed a passion for adventure and protecting Mother Nature. 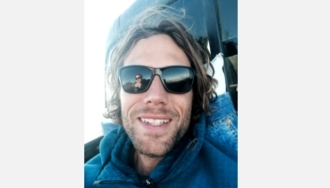 He now resides in Ventura, California, where he works in the social and environmental responsibility department at Patagonia. Over the last few years, he has been exploring the mountains of the west and, most importantly, recently got married to a rad girl he met on a climbing trip in Yosemite.